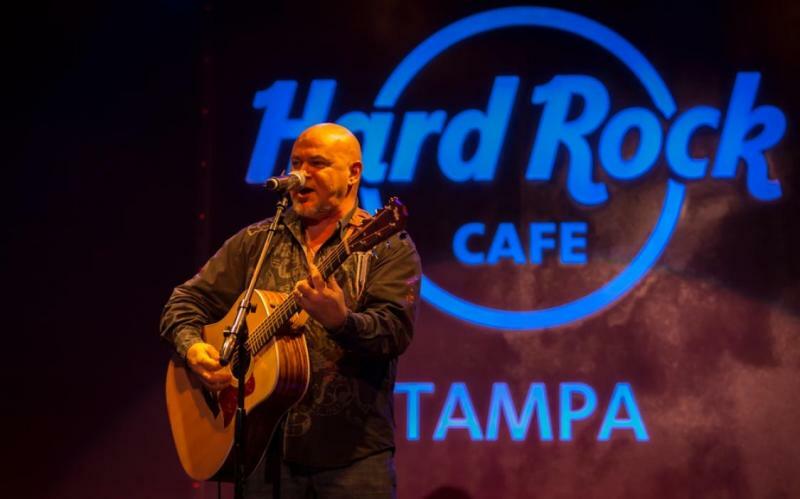 The Tampa Bay Aoustic Music Festival at the Hard Rock Cafe closed out the weekend with stellar performances by John Clark, Fred Chandler Epicoustic, Row Jomah, House of Leros and Charlie Hotel. 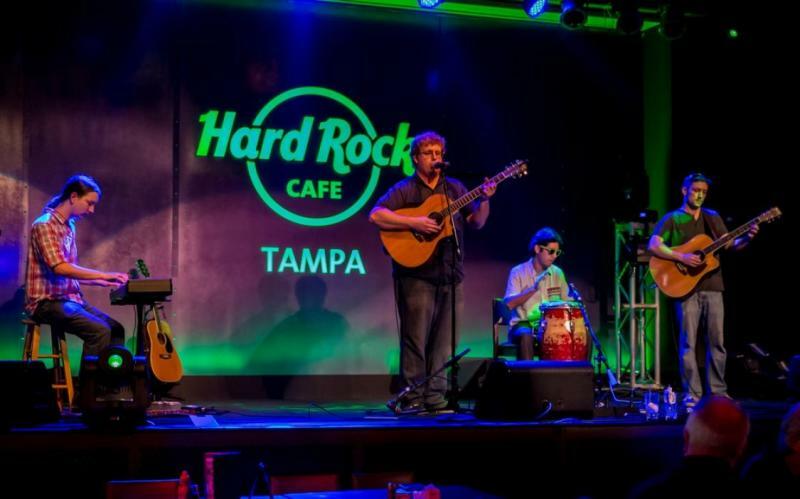 The Hard Rock Cafe is THE place to be in June to hear Tampa Bay’s best live acoustic music. 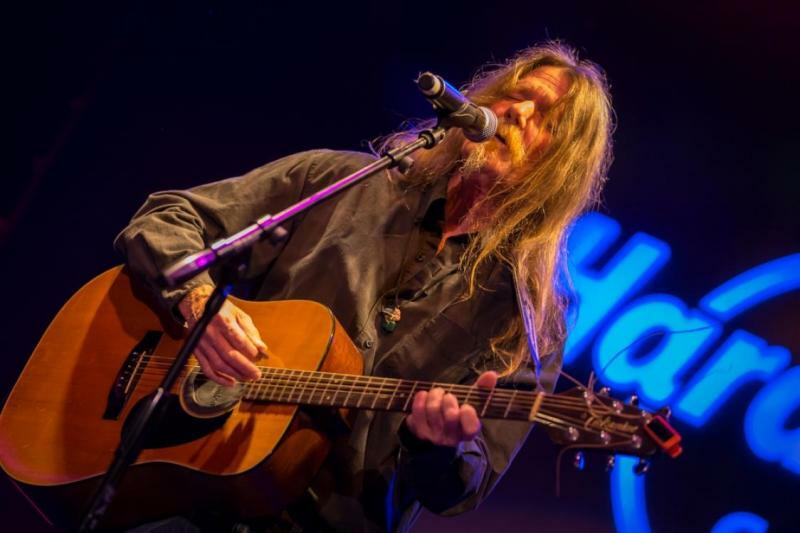 John Clark kicked off the evening with a set of folksy, foot-stomping acoustic fun! 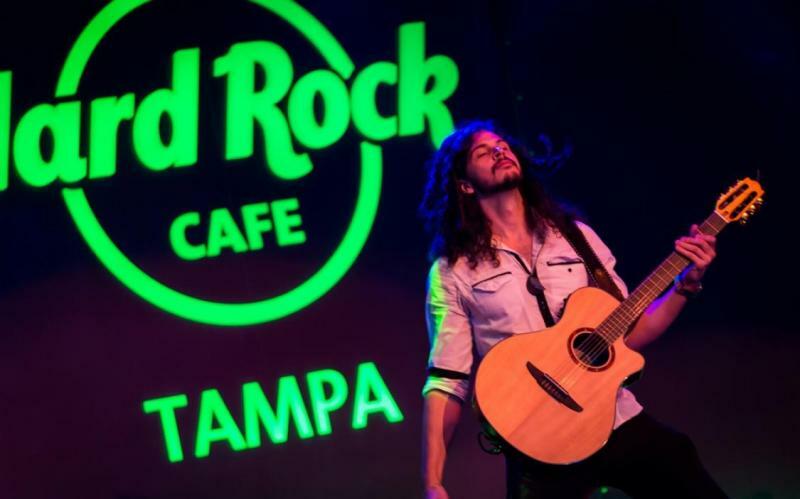 John Clark is a veteran in the Tampa Bay music scene but got his start playing guitar when he was 15. His older brother played and threatened him with “death” if he touched it. Over time, he got bored with it and left it in his closet, leaving time for John to sneak in and “fool around with it”. He eventually took it over, taught himself to play and has been playing in bands ever since. His first band, The Baker Act, was all about “how loud we could play and how much we could drink”. 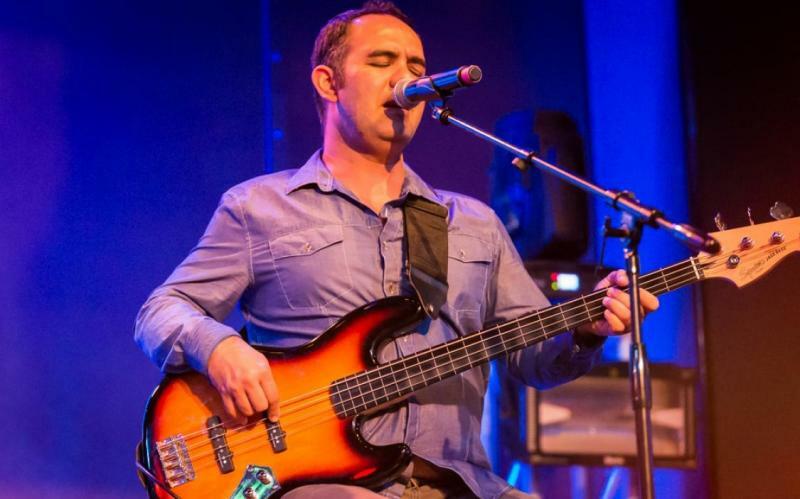 Since then, John has played in dozens of bands and currently plays solo and with his band, The John Clark Band. It was a special Father’s Day for John as he was joined by his wife, son, and extended family to watch his performance. John played a set of mostly original music including a powerful song “Already Home” about his daughter who was hit by a car and killed when she was 27, “Hope and Hard Times” about the hard times people, including himself, went through when the economy crashed and “Borrowed Clothes”, another moving song about going through life with “borrowed clothes”, we borrow the clothes we wear through life and give them back when we leave. Covers included “To Make You Feel My Love” by Garth Brooks and “All Along the Watchtower” by Jimi Hendrix. Stay folksy with John here. 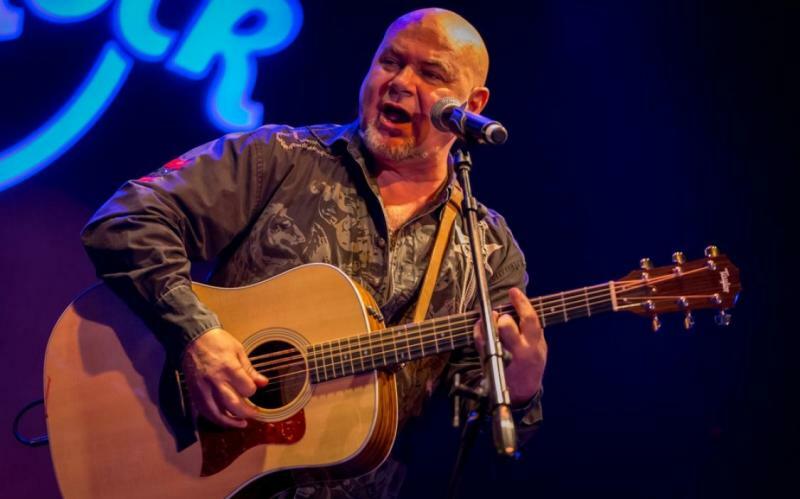 Fred Chandler Epicoustic packed the house and wowed the crowd with his commanding vocals. 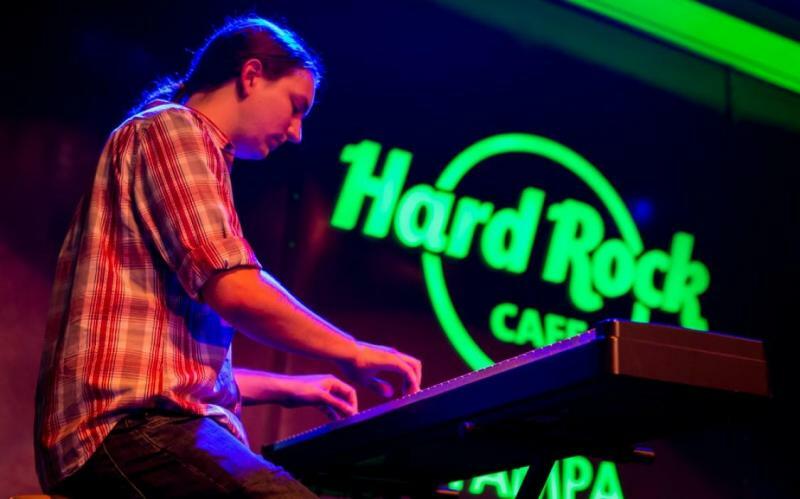 Fred is a multi-talented musician who recently relocated to the Tampa Bay area from Vermont. Not only do Fred’s vocals command attention, he plays guitar, violin, viola, chello, mandolin, dobro, and ukulele. He’s been playing guitar and writing songs for over 40 years! But that voice, that voice! It’s absolutely captivating! Fred performed a set of all original music including “Crystalyne” a song he wrote for a couple getting married about how they met, “Green Flash” a spiritual song about that elusive green flash, “The Arch” a song about a child with leukemia and “Lover’s Overture” his own personal “Bohemian Rhapsody”. In addition to playing solo shows, Fred also plays with The Band 4X. 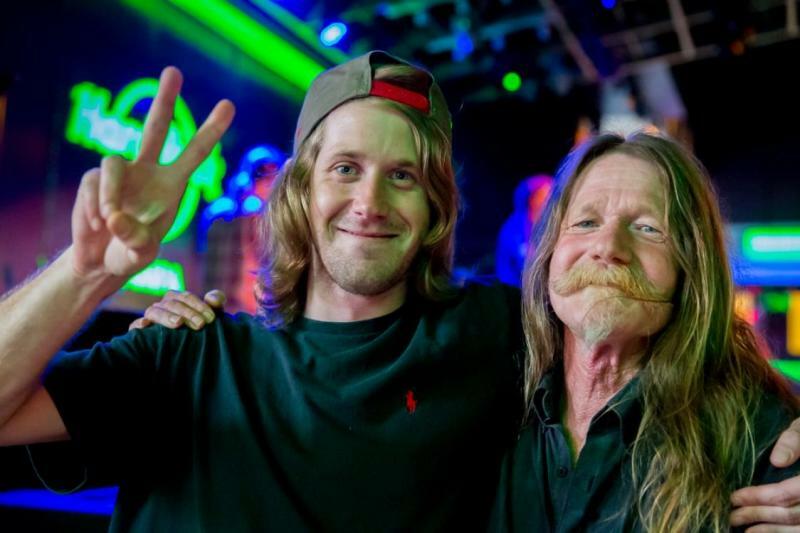 See Fred at Uncle Fat’s Tavern 2 in Tampa every Monday night or follow his voice here. 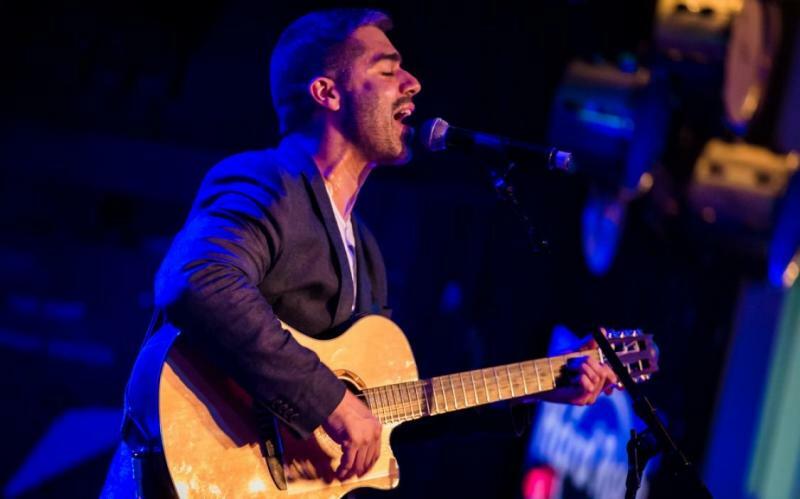 Row Jomah took the stage next for a set weaving classic rock, acoustic rock, fusion, world, funk, blues and folk music together for a truly authentic sound. Band members Joe Roma on guitar and vocals, Melbourne Walsh on lead guitar, Austin Llewellyn on keyboard and Dylan Chee-A-Tow on bongo met at the Dunedin Brewery and have been performing together for two and a half years. Row Jomah performed a set of all original music written by Joe Roma. Joe was a huge fan of the Dave Matthews Band and started playing guitar and writing songs, “wanting to play just like them” when he was 8. Once Joe writes the songs, the other band members fill in with their own unique sound. Songs included “Tell Me” about a girl in a rut, “tell me” what you’re thinking about and maybe we’ll work it out, “Window Panes” and one sided love and “Shudder” a “carpe diem” song about making the most out of life. Row Jomah relased their new album Cat People this past Friday to rave reviews. Catch them at 3 Daughters Brewery in St. Petersburg on July 10th, sneak a listen to Cat People and keep in touch with Row Jomah here. House of Leros took the stage next for a set unlike anything we’ve heard during the Tampa Bay Acoustic Music Festival! Composed of Jessy Leros and Zeb Johnson, this power guitar duo has been playing their version of “World Pop” for the past two years. 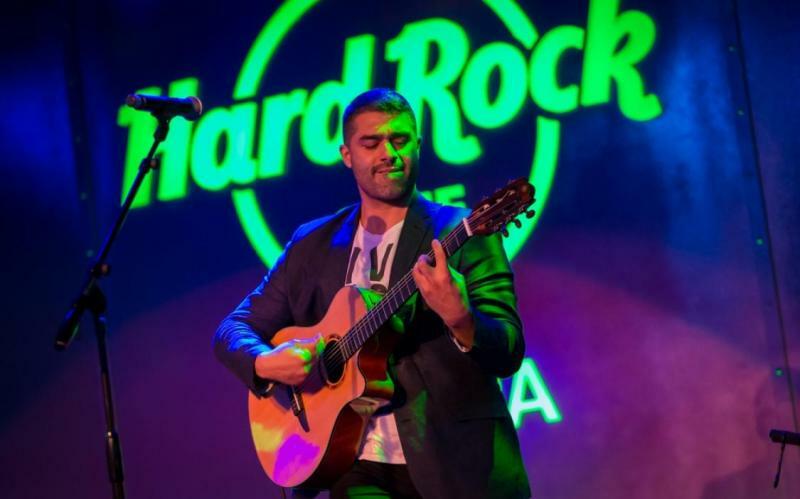 Jessy is originally from Venezuela and started playing guitar when he was 8. His Dad gave his Mom a guitar as a Valentine’s present but instead of playing it, she hung it on the wall. It stayed there until Jessy’s fingers were long enough to play. 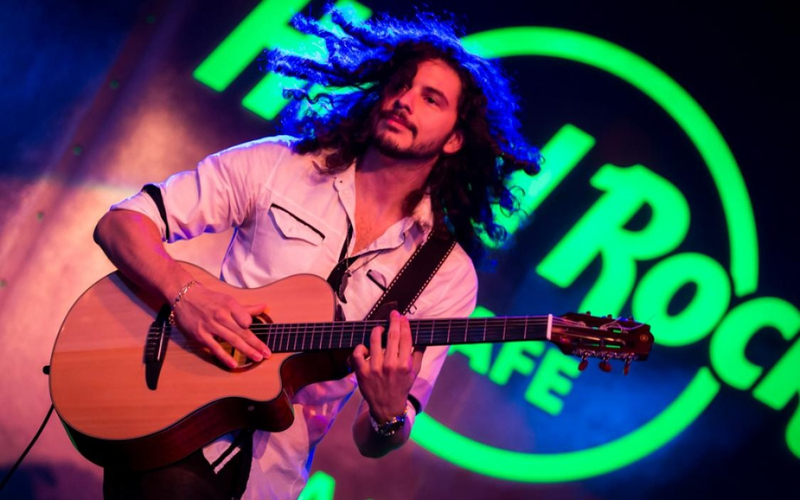 He trained at many guitar clinics and eventually attended the prestigious Conservatorio de Musica Jose Luis Paz in Venezuela. Zeb was inspired by U2 and started playing guitar when he was 12. He originally played metal but switched to classical guitar while attending the University of Tampa. The duo met while performing in the international ballroom and latin dancing touring production Burn The Floor. Since then they have created a genuinely unique sound they call “World Pop”. A little flamenco, a little ethnic, a little world but mostly a whole lot of talent go into creating this mesmerizing sound. Their songs tell stories about different parts of the world and include musical elements or styles from that culture. Their all original set included “Fandango” a song about a soldier fighting and “pushing through” during the war in Iraq, “Monte Carlo” about the Monte Carlo Grand Prix and the experience of driving on that famous track and “Rapture” a love story that takes place in Downtown Tokyo. House of Leros is currently recording an album which they expect to release by the end of the year. They play every Saturday night at the Edge Lounge in Downtown St. Petersburg. Check out this incredible duo here, you will be glad you did! Closing out the night was Charlie Hotel. Composed of Chris Harman on guitar and vocals, Vince on mini-bass and vocals and Jason Caren on drums, Charlie Hotel knows how to get the crowd rocking! 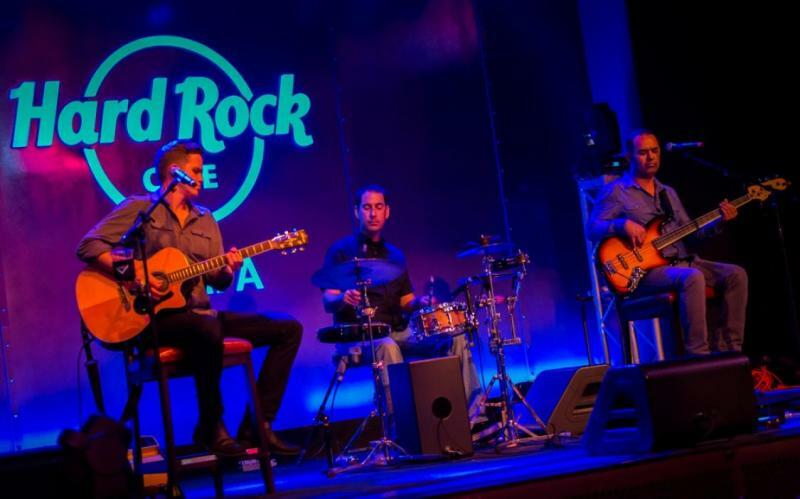 Playing together since 2002, this melodic, modern pop-rock trio plays all over the Tampa Bay area and is known for their penetrating rhythm section. Charlie Hotel performed a set of mostly covers including “Layla” by Eric Clapton, “Ain’t No Sunshine” by Bill Withers, “The Weight” by The Band and “Moondance” by Van Morrison. 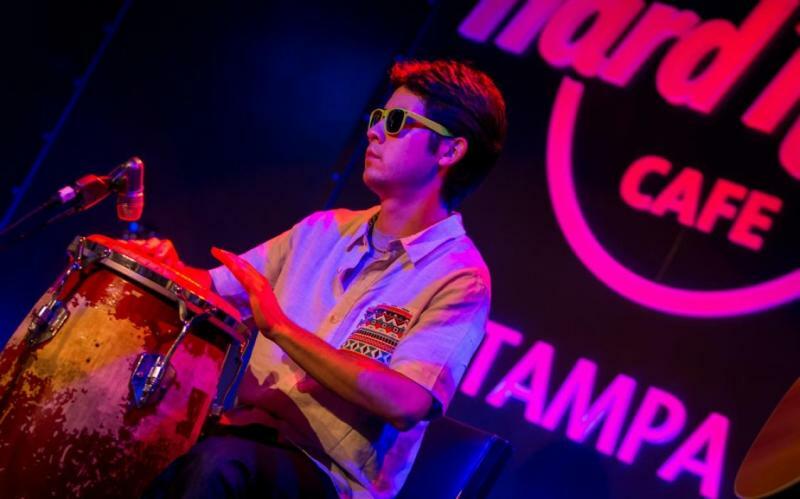 See Charlie Hotel every Thursday at Centro Cantina in Ybor City or check in with them here. Next weekend is the final weekend of The Tampa Bay Acoustic Music Festival!!!! 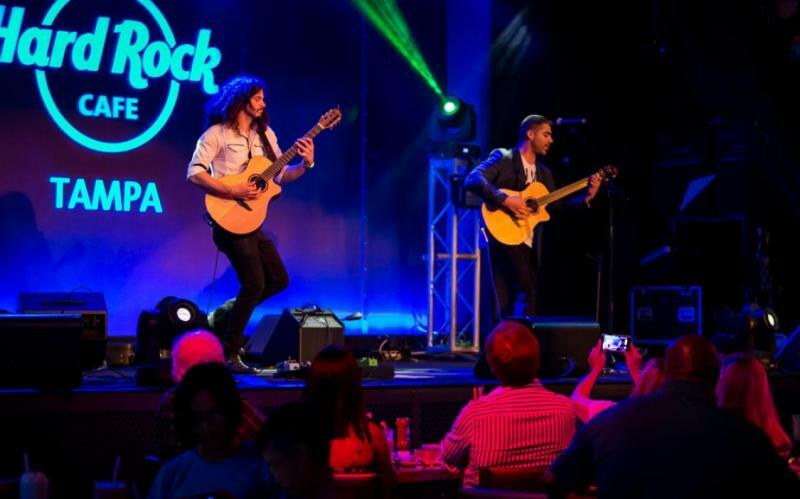 Check out the schedule here and head to the Seminole Hard Rock Hotel & Casino Tampa Thursday through Sunday to hear some of the best live acoustic music Tampa Bay has to offer. This is a festival you don’t want to miss!